Fracking: Significant Water Recycling Achieved in Eagle Ford, Texas | The American German Business Club Berlin e.V. Texas will lead in terms of recycled volume as the industry takes off in the next year or two. While Texas’ regulatory structure creates a good atmosphere for encouraging water recycling, some western states that are experiencing droughts, ironically, have regulations that discourage water recycling. In his discussions with regulators and legislators, Sumner noted that Texas has some of the best regulations in terms of protecting the environment as well as being workable for the oil and gas industry. Officials with Dow Water & Process Solutions and Omni Water Solutions Inc., an Austin-based water treatment technology company, expect the number of barrels of water treated at an Eagle Ford project to pass the one million barrel mark by the end of 2014. The partnership of technology between the two companies has allowed for the treatment of over 725,000 barrels per day (bpd) of water at an oil and gas project in Karnes County, Texas since the project began in June 2013. The project operator was having issues with boron, which occurs naturally in produced water in the play, and was interfering with the performance of the customer’s fracking and gel systems. “They needed a way to get the boron levels down,” said Warren Sumner, chief executive officer of Omni, in an interview with Rigzone. Combining Omni’s HIPPO mobile water treatment unit with Dow’s portfolio of membrane technology is allowing the customer to do something innovative and fairly difficult technically – taking out produced levels of boron from water for reuse without affecting cross link fluids in their chemistry while making a tailored clean brine product used for workovers, said Sumner, adding that he is not aware of any other companies doing this in the oilfield. Omni is using membranes supplied by Dow in the operator’s water treatment system to address the operator’s issue at the lowest possible price. “We are using ultra-filtration, nano-filtration, and reverse osmosis membranes, depending on how our customer wants to use their produced water,” Sumner explained. In the Eagle Ford, Omni is using these membranes to make clean brine for work over fluids and fresh water for hydraulic fracturing fluids. 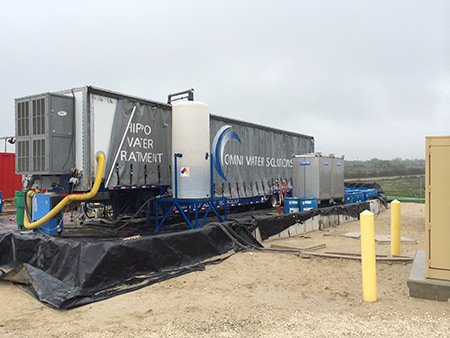 Omni’s HIPPO® mobile water treatment unit includes both Dow ultrafiltration and DOW FILMTEC™ Reverse Osmosis (RO) membrane technologies (Karnes County, TX). The customer then uses it for workover fluid. Membranes – spiral-wound cylindrical elements that fit inside long white tubes – have been widely used in other industries, but the technology is relatively new to the oil and gas industry. “Dow has many different types of membranes that we can use to focus on contaminants that are a problem for oil and gas operators. Combining different membrane structures and materials enables us to tailor performance to the specific requirements,” said Sumner. Historically, membranes do a good job of separating elements from water at a low price, Sumner explained. Membrane technology and other traditional methods of technology, which include chemical precipitation, oxidation and vapor recompression, are being applied to the oil and gas industry for the first time as the industry seeks ways to treat and recycle water. The solutions that have been used have counted on consistent water chemistry and being able to treat water to a consistent standard. But in the oilfield, the standard to which water must be treated depends on the fracture chemistry and the stimulation chemistry the operator has used, Sumner noted. The level of contamination in oil and gas wells has made it difficult to enable a membrane to exactly what it’s designed to do. In the past, companies have tried simple approaches to using membranes to treat water, and failed because they overwhelmed the membrane. Rather than requiring membranes to remove things they were not meant to do, Omni combines several different technology in front of membranes so they can function as they were intended. The Karnes County project marks the first collaboration between Dow and Omni. “We wanted someone with a deep technological background to cross-pollinate the lessons learned from other industries,” Sumner said of Omni’s decision to partner with Dow. Dow also recognized that Omni offers a sophisticated platform through which it could advance its membrane technology. One of the things that attracted Dow to Omni was their ability to protect membranes and willingness to go out and develop application for different membranes. Earlier this summer, a number of oil and gas companies visited the Omni customer in Karnes County to learn about they were able to treat water as they search for water treatment solutions to address their concerns about having enough water to accomplish their operational goals. “As they look at potential threats to supply of water, whether it’s regulations or social license to operate, at the moment, they’re most concerned about the social license to operate. To address both issues, companies are looking at ways to recycle water economically. Finding economic ways to do so is key in the face of rising capital expenditures that the industry faces,” said Sumner. Sumner predicts that Texas will lead in terms of recycled volume as the industry takes off in the next year or two. While Texas’ regulatory structure creates a good atmosphere for encouraging water recycling, some western states that are experiencing droughts, ironically, have regulations that discourage water recycling. In his discussions with regulators and legislators, Sumner noted that Texas has some of the best regulations in terms of protecting the environment as well as being workable for the oil and gas industry, Sumner noted. The Texas Railroad Commission is also very active in working with oil and gas operators and treatment companies to find where there are regulatory barriers that inhibit the growth of recycling and solicit input into removing those hurdles. Oil and gas companies today in Texas can buy from a landowner 42 gallons of water at 50 cents per barrel, but that’s not the best use of the state’s water supply. Instead, brackish water sources and treated water should be tapped for oil and gas exploration and production, rather than freshwater pulled from the ground. Water shortages are prompting oil and gas companies to adopt water technology. Eventually, the adoption of water technology will be driven by the rising price of water. On a global scale, the United States pays a relatively small amount for its water. At the macro level, the United States pays about a third of what countries in Western Europe. Ironically, and not surprisingly, the United States uses a correspondingly large amount of water and triple what is used in Europe, Sumner noted. The winners will be companies that can effectively deploy a portfolio approach to treatment technology to solve an operator’s problem in any basin. In terms of new technology, Sumner has not seen a killer category emerging, just because the requirements of operators and water chemistry is so different from place to place and well to well. However, Sumner sees continuous innovation in all of the technology being applied in the oilfield, including further innovation in membrane technology. 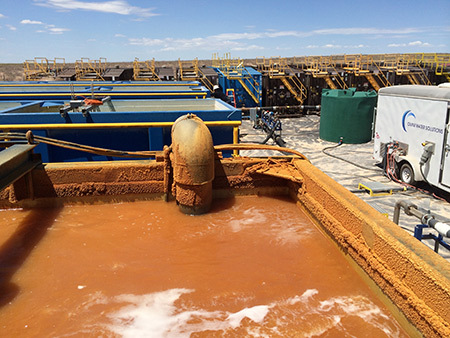 Onsite produced water treatment operation in Lea County, NM. Rather than forcing a single technology to meet operator requirements, Omni uses several different proven treatment technologies, and combines them with real-time analytics and a proprietary software operating system to allow the company to deliver the right solution and to address specific fluid chemistry of operator requirements. “The combination of variables such as the chemistry of the water and the different demands that different operators place on water treatment, means that a one-size-fits-all treatment is difficult. Instead, a portfolio of technology options specifically for operators needs to design a customized treatment option each time Omni goes to a field,” Sumner noted. As the water chemistry mixes together and comes back, wild swings in water quality occur. Typically, in a given area, Omni tries and applies several different treatment technologies together for a number of wells. On one day, the front end of Omni’s treatment system is working at maximum capacity, and then another day, Omni see the back-end of the treatment system working at maximum capacity. “If you deploy a combination of solutions, you don’t have to change treatment technology from well to well,” said Sumner. Different plays face different challenges, Sumner noted. Boron does naturally occur in the Permian Basin, but not at the level seen in the Eagle Ford. Instead, lack of water presents a major challenge for the Permian Basin, which has nearly twice the level of drilling activity compared with the Eagle Ford. It has a huge amount of activity and not enough water to support all the activity so the Permian is really having to look for different solutions and different water sources it can tap to supply fracking crews enough supply to get the job done, Sumner commented. Omni, which has been around six years and running oilfield water for the past five, is active in the Permian Basin, the Barnett shale, and has started a new project in New Mexico. The water issues in southeastern New Mexico are even more severe than the issues on the Texas side of the Permian Basin because there is less water available for fracturing and less infrastructure for waste water transfer and disposal. There have also been regulatory hurdles to recycling but New Mexico’s regulators are working with operators to find ways to make recycling more practical, Sumner noted. The company is also talking with customers about offering its services in Oklahoma and Colorado. “We’re expanding into southwest, where significant hydrocarbons exist but a shortage of water presents a major challenge for the oil and gas industry,” Sumner noted. To date, the company has not been active in the Marcellus shale play in Pennsylvania and West Virginia, but Omni recently introduced a solution into the Permian Basin that the company thinks would be very applicable for the Marcellus. The company has deployed sales representatives to the Marcellus and the Utica play in Ohio, and Sumner expects Omni will be doing business in the Marcellus by the end of 2014. Oil and gas companies are sourcing water from lots of different places due to shortages in the Permian and parts of the Eagle Ford play as well. 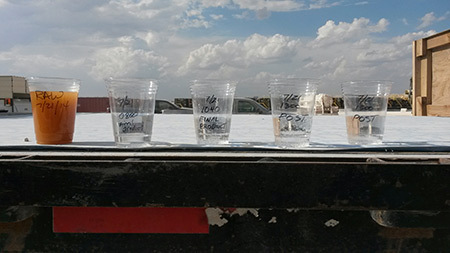 Produced water results before and after treatment in Lea County, NM. The Permian Basin and Marcellus are in two very different regions of the United States, but the salinity of the Permian water approaches that of the Marcellus. While the water chemistry used in frac jobs in the Marcellus would be different from the Permian, the Permian solution is very tolerant of some constituents in the water, meaning that less treatment is needed in the Permian, Utica and Marcellus. “The techniques we are using will be very applicable up there,” Sumner noted.